We were blessed with an excellent assembly this past Monday, brought to us by the PTO! Mr. Peace ( www.mrpeace.org ) reinforced the importance of seeing people for their heart first and foremost, and he stressed that one word or action, positive or negative, can change a life forever. His words, his video clips and his visuals helped to reinforce Christ’s message of love, and Mr. Peace encouraged all ages to have the courage to do what is right. He made a video message for our school community, which you can click on below. We are very proud of all our students, from their performance in academics to athletics to the arts to service leadership! 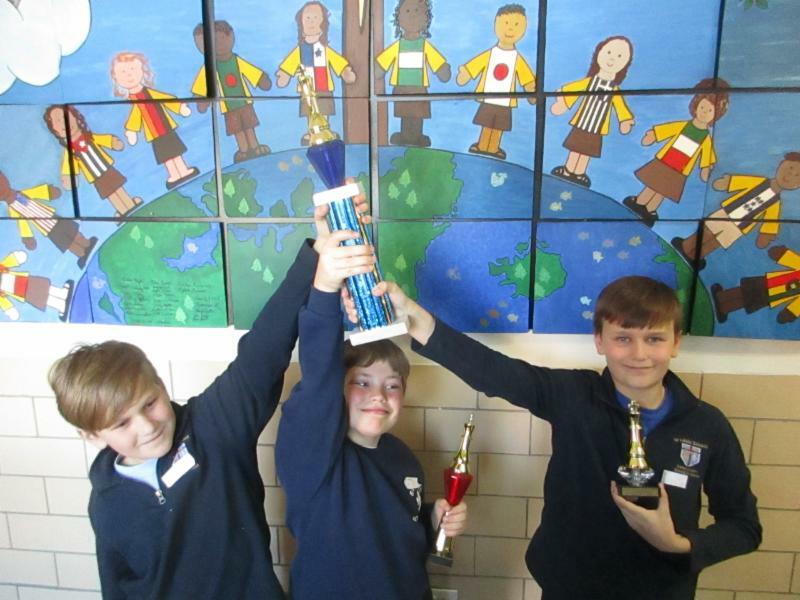 Last weekend, several of our students competed for St. Louis School in St. Rita’s regional chess tournament. Each one of them competed with grace: as a group, they brought home the first place trophy for the 9-10 year old age group; Filip Boras brought home the fifth place trophy for his age group; and Malcolm Canty brought home the second place trophy for his age group! I hope your children (whether they are Kindergarteners all the way up through eighth graders) have shared the joys of chicks hatching! We celebrate new life from conception, and our egg hatching program is a beautiful way to do just that. We have 5 new little chicks, who all hatched on April 4 th ! They will be with us until next Thursday, so your children will continue to watch them grow in these early days. Have a blessed weekend, and don’t forget to take advantage of the used uniform sale and the bake sale this weekend! Each day our school community prays for the intentions of our families. This week the following families were included in our prayers: Schroeder, Schubert, Schulte, Schwieterman, Scully, SeGraves, Sendi, Sheedy, Sheehan, Shefrin and Silis. Students who attended our Sunday CSW Opening Mass have earned a Comfy Clothes Day for this day! If they didn’t come to the Mass, they are still welcome to dress in a PE uniform for our Zumba exercising. 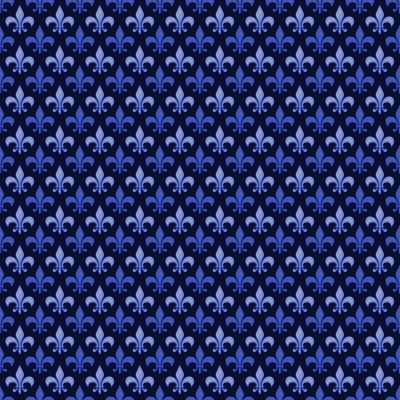 Purple Up! Purple Sock Day! We are celebrating National Military Child Day and all of our military families with a Purple Sock Day! All students (and teachers) are welcome to wear purple socks (or mostly purple socks) to school. God bless all of the branches of our military! Class Photos will be taken on this morning, and all students should wear their standard (non-PE) uniforms to school. They are welcome to bring sneakers to change into if it is their regularly scheduled PE day. May Lunch Orders Due April 17th! 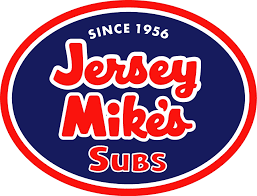 The May lunch ordering period closes on Wednesday, April 17th. All orders must be placed online. Please follow this link to go directly to the online order form . Yearbook Orders Due May 2nd! Yearbooks may be ordered online at commpe.pictavo.com . All online orders are due by May 2nd. Yearbooks ordered online are $25. After May 2nd, paper orders (first-come, first-served) will be accepted and the price will increase to $28. For ordering instructions, please see the attached flyer . 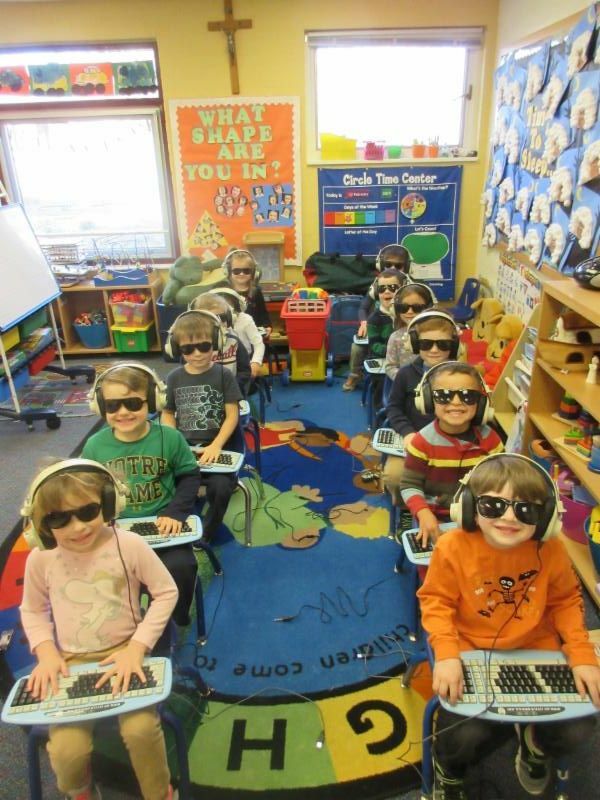 preschool registrar, Dare Hurley, at 703-768-7732 or dhurley@stlouisschool.org to arrange a tour of the preschool. We look forward to sharing our wonderful program with you! All requests for tax receipts for calendar year 2018 must be emailed to EDC Accounting's Ruthie Cody ( edcaccounting@stlouisschool.org or rcody@stlouisschool.org ) before April 30th, 2019. The PTO’s ability to achieve its goals is dependent upon the work of a large number of volunteers. Without the help of these volunteers, we simply could not deliver as many programs or provide the current range of products and services to the students. You are invited to nominate someone you believe merits the PTO Distinguished Volunteer Service Award. This Award honors individuals who have made a significant impact to the students through volunteer efforts. Please see the attached flyer . Spring Uniform begins April 15th! Need more spring uniforms? Come to the Used Uniform sale on April 6 & 7 in McClunn Hall! See the flyer for details. Volunteers are needed to help out with the Used Uniform and Bakes Sales. Virtus not required. Please see the sign-up's below in Volunteer Opportunities. If you are interested in a more active role with the PTO, or would like more information on any of these positions, please email Sharon Moss at srjones@hotmail.com . Attached is the updated list of completed PTO volunteer hours as of April 1, 2019. If your name is on the list, that means your family has met the complete requirement of 18 hours for a two-parent family or 9 hours for a single parent family. If your name does not appear on the list, and you have met the requirement, please email the volunteer coordinators so that we can make sure we have your hours recorded. Thank you for your time and dedication to our school. 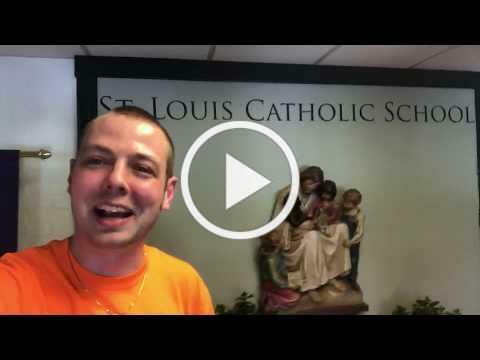 Your involvement and help are what make St. Louis School a wonderful community. ﻿ Individual families are required to track their volunteer hours throughout the school year and to submit them to the PTO Volunteer Coordinators for credit. Volunteers must have completed the VIRTUS training seminar AND have a background check clearance to participate in these volunteer opportunities. Help needed planning and day-of! Saint Louis Advanced Band Students are invited to participate in a T-shirt design contest for our band trip to Hershey Park! The winner gets a free t-shirt! Design should be one color on a white 8 ½ x 11 sheet of paper. Please make sure you include the words “St. Louis Band” and the year “2019” in your design. Otherwise, let your imagination soar! Please include your name, grade and class on the back of your submission. The CYO is instituting a new award this year to honor a Coach of the Year. This award will be given out each year to a coach who best exemplifies the “Virtuous Excellence” that is the motto of our CYO athletic program at St. Louis. Nominations can be made by parents and/or students, and the selection committee will be comprised of Father O’Hare, John Bednarek, Marianne Olson and Jose Quiroz, none of whom will be allowed to nominate anyone for this award. Please send a short narrative to John Bednarek at cyodirector@saintlouisparish.org by April 19, 2019. The narrative should address why your nominee exemplifies the qualities listed in the document linked here. All nominees will be recognized and the winner will be announced on May 19th at our end of the year CYO celebration. St. Louis Students Eli Swanson and Katie Dunn, and St. Louis Alum David Anthony are all featured in MVCCT’s spring production of Peter Pan . There will be 6 performances next door at Bryant High School on March 29, 30 & 31, as well as April 5, 6 & 7. All shows are extremely family friendly and appropriate for all ages. Tickets can be purchased in advance on-line , or at the door in advance of performances. Come fly away to Neverland with the entire cast! St. Louis Youth Ministry invites all current 8th graders and high schoolers to join our trip to Franciscan University of Steubenville Ohio Annual Summer Youth Conference from Friday, July 19th through Sunday, July 21st. This trip would satisfy the Confirmation retreat requirement (note: we are currently offering a one-day retreat during the school day on May 13th). Go to https://saintlouisparish.org/confirmation-retreats for more information and to reserve a spot. Spaces are limited! If you have any questions, contact Ryan Farrell ( ryan@saintlouisparish.org ). Serena Moss, a 6th grader at St. Louis Catholic School and a Girl Scout Cadette in St. Louis Troop 1697 is working on her Girl Scout Silver Award . She is collecting clothes for the emergency room at the INOVA Alexandria Hospital. Please consider making a donation of new or lightly used, sweatshirts, sweatpants, t-shirts and/or shorts. All donations should be clean, unisex, and preferably with no logos. Sizes XS to XXL are needed. The collection box is by the St. Louis School office through April 16th. Friday Fish Fry - March 8 - April 12, 5-6:30pm. Please see flyer for more information. 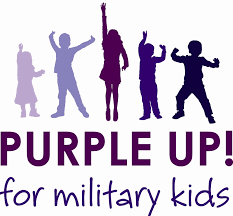 Wednesday, April 10 - Purple Up! Purple Sock Day!